You may already have read about the successful collaboration between Hellon and the Irish Musgrave Group, which recently won the award for best international service design work at the Service Design Global Conference 2018. The winning project, which resulted in an estimated EUR 5 million incremental effect on annual revenue, was based on a systematic use of service design, not coincidence. In this article, we highlight the pioneering work done by the Musgrave Group in incorporating service design into the corporate strategy and engaging the entire organisation in design thinking. Advancing design thinking in an organisation may at first seem like swimming against the current. Personally, you may be ready to set targets for a service design project and “take action”, but the management team is not ready to invest, wants to make sure benefits and results are rapidly measurable (often in the next quarter already), and/or need a better understanding of service design overall. Does this sound familiar? The 142-year old Musgrave Group is Ireland’s largest grocery retailer and wholesaler, as well as the largest private sector employer in the country. In addition to Ireland, the Group has grocery stores in Northern Ireland and Spain. Siobhan Hennessy, Head of Customer Experience at Musgrave Group, has over 15 years of experience in managing customer experience and service design projects at various companies. During her two years at Musgrave Group to date, she has been involved in nine different service design projects. One of the key factors for the fruitful collaboration between Hellon and the Musgrave Group has been the commitment to service design throughout the organisation, as well as prior experience of using a service design approach. However, Rome was not built in a day, and the same can be said for establishing service design as a strategic tool: it takes time, committed work, and calculated steps. Strategic utilisation of service design starts with the smallest but most careful of steps, the first of which is finding internal support for projects within the organisation. For example, to successfully launch the Hellon & Musgrave “Baby” project, it was crucial for Hennessy that the company’s HR manager was inspired by the new ways of working brought in by the service design project, enabling the company to improve its innovativeness and agility. It is imperative to build a support network around you, e.g. from upper middle management or managers you already know recognise the value, impact and operational benefits service design offers. These people become your most important ambassadors. At this stage, it is important to pay attention to the impact of storytelling: trust is built through the presentation of good case studies, before and after stories, and through a clear and concise explanation of a problem and its solution. If you are just getting started, begin with small scale projects you know will bear fruit quickly and increase the scale of your projects as you grow more experienced. Once you’ve learned the ropes, you will be able to provide evidence and results for your business. Therefore, instead of undertaking demanding strategic projects right from the bat, start with smaller projects you know you will be able to implement in practice and manage them successfully. By demonstrating that even minor investments in service design can impact operations, you will receive increased attention and trust in the use of service design as a strategic tool. Make sure to form a skilled and multidisciplinary team which combines the excellence of different departments and/or specialisations – providing your service design projects with important leverage. In addition to bringing information into the team, this internal impact group also distributes information back to its own units, slowly breaking internal silos and walls between departments. When assembling a multidisciplinary team of experts, it is important to pay particular attention to the fact that team-members are sufficiently senior and hold decision making power, and that everyone is committed to service design and willing to put the work in. This will ensure an ability to action changes. Once again, narrative and stories play an important role. When your team is able to take part in customer research or test prototypes on a client interface, for example, and to see the immediate impact and significance of the project on the customer, inspiration will arise and trust in the project increase. In one way or another, the management team wants to see growth in turnover and profitability. To provide them with real and tangible results on the impact of service design projects on operations, invest in measuring the effectiveness of your projects which will enable you to consistently demonstrate success at each stage. Measurement and numerical results are by no means the only way to convince management of the benefits of service design, but they are definitely the most concrete. When you are able to demonstrate that the company’s turnover has increased by X amount compared to baseline figures, you will surely catch the attention of your audience. According to Hennessy, at the Musgrave Group, a 5 to 8-week project already provides enough data to measure the impact of the project and to calculate its effect on turnover. You should also place importance on establishing and nurturing continuous business relationships. Tell people you meet about the service design projects you have been working on and what they have accomplished. Instead of business jargon and numbers, here we recommend a focus on portraying the customer perspective, as well as establishing a genuine emotional connection. This is often based on discussing the customer perception and experience of going through a change. Excellent tools for storytelling include empathy videos, direct quotes from customer feedback and images. Networking within your organisation is of utmost importance as well, as it will help you create a positive attitude towards service design, as well as increase understanding amongst those without prior experience of the impact service design has on improving customer experience and organisational performance. Participating in various international competitions with your project, and receiving recognition through awards, will not only result in increased external awareness about your project and your organisation, but can, more importantly, convince leadership that service design really works and is worth investment. As with every business with a customer base, you also need to have evidence of your success. Through awards and accolades, you will increase the level of internal trust earned through hard work, and also take one step forward in engaging the entire organisation in service design thinking. “If my service design agency is successful, I’m successful.” – Siobhan Hennessy, Musgrave Group. Hennessy mentions that the Musgrave Group conducts 70% of service design projects in collaboration with an external service design agency. The choice of partner is not always an obvious choice, according to Hennessy, but based on the building of a mutual relationship and active cooperation by both parties. It is important for her that cooperation is mutually beneficial and genuinely collaborative. What made the collaboration with Hellon particularly fruitful was a mutual commitment – by Hellon but also by the Musgrave Group itself. “Hellon’s service designers are the most experienced experts in their field, but we know our company better than anyone, so it is important that the projects always involve the right people and that internal orientation is fine. Your team must be 100% committed to a service design project. If our service design partner succeeds, then we too will succeed.” Hennessy sums up. As previously stated, committing the entire organisation and corporate management to the strategic use of service design does not happen by snapping your fingers, but takes time and consistent hard work. By ensuring you are supported by experts committed to service design thinking, both internally and externally, and successfully implementing well-planned projects, you are one step closer to your goal of establishing service design as a strategic tool in your organisation. Don’t hesitate to get in touch to discuss how we might be able to support you in meeting your service design needs! 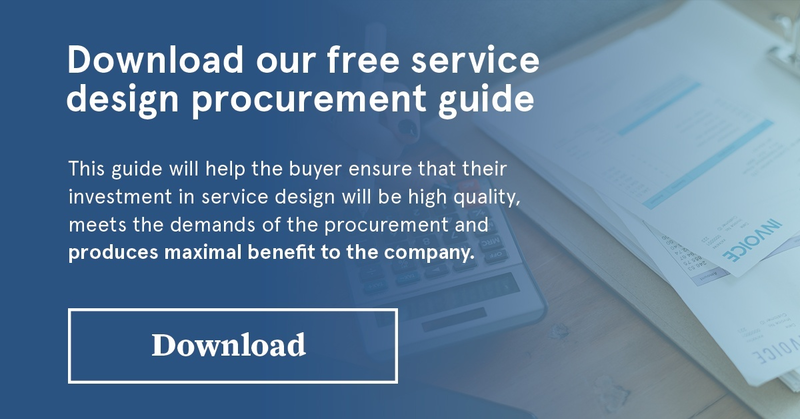 Read more about what to keep in mind when selecting a service design partner in our service design procurement guide.